When you think about it, driving is very much a symbiotic relationship between driver and machine: the driver controls and operates the machine, and the machine performs and functions for the driver. Without the driver, the machine would have no one to…well, drive it, and without the machine, there would be nothing to drive in the first place. Really, car and man rely on each other just as much as the engine relies on well-oiled components to run smoothly and safely. If It’s Porsche-Related, HOUSE Automotive Can Help! In our previous blog post, HOUSE Automotive covered some of the most common errors that drivers tend to make when they’re out and about on the roads. Here’s the thing, though: we can’t control what you or other drivers do on the roads. Our independent Porsche repair technicians can, however, control how your Porsche runs. You see, by regularly visiting our Pasadena Porsche repair shop (with a second location near Encino soon to come — more on that later! ), you can ensure that certified Porsche repair technicians are routinely assessing the condition of your vehicle, ultimately setting you and your Porsche (driver and machine) up for thousands and thousands of smooth miles to come. To us, that’s how a Porsche was meant to exist — to be driven with gusto, and to consistently perform up to its performance potential. Anything less would be an automotive crime! 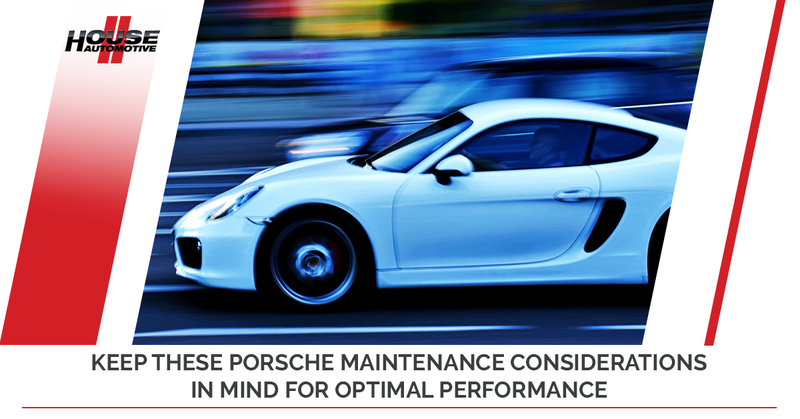 Below, we’re going to cover some very important maintenance pointers that you should keep in mind as you’re driving in between routine appointments with our independent Porsche mechanic team. Overdue for an appointment? Don’t wait — contact us today or schedule an appointment here. How often you should get your oil changed depends on how hard you’re driving your Porsche, and what model you have. A stock, base Cayenne isn’t going to be quite as “high-performance” as a top-of-the-line 911, and so going 5,000 or so miles in between oil changes will likely be just fine. But a car that’s suitable for the track? To get the best performance possible and ensure that no damage is caused to your engine or other mechanical components (you are driving it hard, after all), more frequent oil changes are highly recommended. It’s never a good sign if your brakes are getting squeaky or “screechy.” With fast driving comes fast braking (yet again, HOUSE Automotive does not condone fast or reckless driving — save fast driving for the track, not public roads! ), which tends to wear your brake pads out rather quickly. Worn out brake pads can lead to rotor and caliper damage down the road (literally), so if your brakes are metal-on-metal for any reason, get them checked out immediately. You might save money in the short term by using less expensive aftermarket parts, but just know that these cheap parts can cause issues in the long run. Approved by Porsche themselves, genuine replacement parts are not only backed by an extensive warranty, but offer you the reassurance that your Porsche is receiving the exact parts that it was originally designed to run on. If you’re a Porsche mechanic who really knows what they’re doing, well, that’s one thing — but otherwise, don’t take the gamble with aftermarket parts. If you’re looking at your tires and you can’t see any tread on them, then you’re in trouble. Tread not only provides you with more grip on the road, but also allow water underneath the tires to be expelled in order to prevent hydroplaning. Normal driving shouldn’t eat at your tread levels too much, but “spirited” driving (ahem, see our disclaimer from above) will wear at your tires much more quickly as you take turns at faster speeds, brake harder, and accelerate fast off the line. This is especially true for vehicles with low profile (essentially thinner) tires as opposed to thicker, chunkier tires. As an independent Porsche repair business, we’re not really inclined to tell you to visit the dealership — as independent specialists, we’ll do an even better job at a cheaper price. However, overpaying at the Porsche dealership is still a better deal than visiting some European auto shop that “specializes” in multiple foreign car brands. Sure, that might be a better option than visiting a mechanic that focuses on domestic vehicles, but you’re always better off visiting a shop that’s trained and certified by Porsche themselves. Trust us. In terms of urban factors, parking your car in the wrong neighborhood in Los Angeles could lead to some less-than-ideal consequences. A giant scratch down the side of your driver door could cost you a pretty penny to fix, and that’s far from the worst that could happen. Practice good street smarts and always be mindful of where you’re driving or parking. A clean vehicle just feels like it runs better — it certainly looks better, to be sure. Take pride in your Porsche and keep up with weekly washes! Questions About Taking Care Of Your Porsche? HOUSE Automotive Can Help! To no surprise, our independent Porsche repair specialists love talking about all things Porsche. Drop us a line today or schedule an appointment to see how HOUSE Automotive in Pasadena can help you and your Porsche thrive!